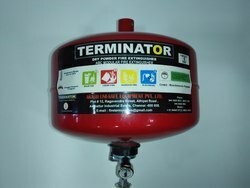 Our product range includes a wide range of modular fire extinguisher. We have complete allegiance in developing highly demanded Modular Fire Extinguisher. We bring forth a highly functional range of modular fire extinguishers for high risk machinery areas. The offered model is developed with advanced manufacturing techniques and can be availed with water, dry powder and clean agent (HFC gas) type fire extinguishing agent. Further, we implement advanced testing techniques to confirm the industry compliance of the offered model which is available from us in varied sizes at a leading price.